Bring Mom to meet the Queen this Mother’s Day. Bring Mom to see the Queen this Mother's Day at the Canadian Automotive Museum. 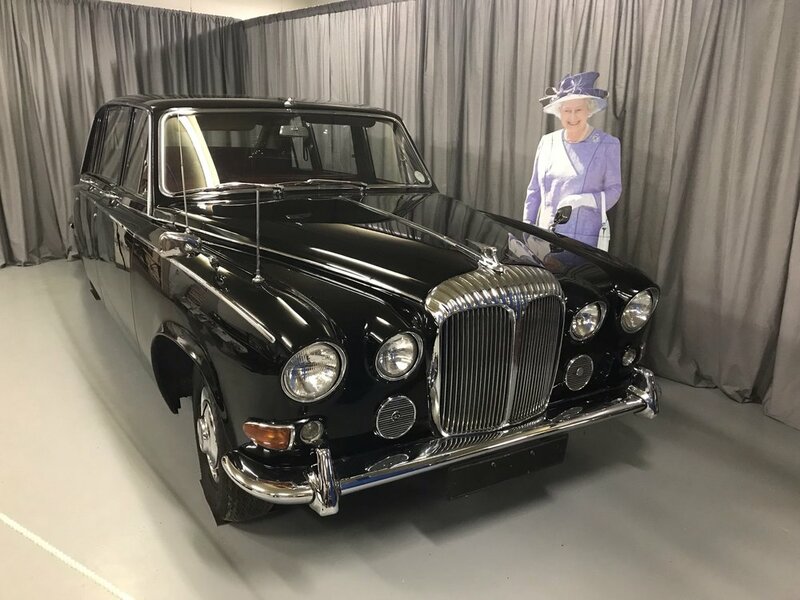 Snap a family photo with a cutout of Queen Elizabeth II in front of our 1969 Daimler limousine once used by the Royal Family. Complimentary tea and biscuits will be available to celebrate this royal Mother's Day event. At 1pm learn about the contributions of women in automotive history and royal connections to the collection during a tour of the museum's galleries. Regular admission rates apply, members free. Members of the Canadian Automotive Museum are invited to attend the Annual General Meeting. Executive Director and Curator, Alex Gates, will present to the membership on the state of the museum and future plans. Refreshments will be served. Spring has arrived and it's time to put the top down on the car! Join us for a special tour celebrating the cars in our collection with Irish and English connections. From the DeLorean made in Northern Ireland, to the Isotta Fraschini purchased by Irish nobility. Regular admission rates apply, members free. The Canadian Automotive Museum is a great place to visit during March Break. Drop-in activities and crafts will be available for families throughout the week and tour guides will be available to answer questions. Family Day 2019 - Winter Racers! The Canadian Automotive Museum is the perfect place for families with young children to spend Family Day 2019. Crafts, activities, and guided tours will be available throughout the day and are included with admission. This year kids will be able to make their own snowman craft, take part in a scavenger hunt sponsored by Hagerty Insurance, and get their picture taken with Lightning McQueen. Special guest Steve Fisher from Balloons with a Twist will be making balloon animals for visitors between 10am and 3pm. Kids can grab a free balloon animal during Family Day 2019 at the Canadian Automotive Museum. Families can make a fun winter race car driver craft to take home. The Canadian Automotive Museum will be open extended hours during Family Day, Monday, February 18, 2019, to accommodate visitors - 9am to 5pm. Romance is alive and well at the Canadian Automotive Museum Valentine's Day weekend 2019 in downtown Oshawa. Bring your "love bug" by the Canadian Automotive Museum for a tour of the gallery featuring automotive love stories. Expert tour guide Bob will explore stories of love and loss related to automobiles on display. Discover the history behind the iconic Rolls-Royce's hood ornament, learn the intriguing tale behind a Canadian knight and a Italian countess, and hear the last romantic words of Isadora Duncan before her untimely death in a Bugatti. Make a date of it and take your sweetheart to a local establishment in downtown Oshawa for lunch or a coffee. This tour is included with regular admission to the museum. Members free. Please not that the Canadian Automotive Museum galleries will be closed January 14-19, 2019 for scheduled maintenance work. At this time the floor of the main gallery will be repainted so visitor access is not possible. Administrative offices will remain open during the work. Kids can make a festive craft this Winter Break to take home at the Canadian Automotive Museum. Bring your family to the Canadian Automotive Museum during Winter Break and enjoy seasonal kids crafts. Children can make their own festive tree or candle to take home in the main gallery. All activities are included with regular admission. *Update* Lightning McQueen has extended his stay through Winter Break so you still have time to grab a picture with this movie star. Please note the museum is closed December 25 & 26, and January 1. Join CAM Curator Alex Gates as we explore the luggage racks, trunks and frunks (front trunks) in the Canadian Automotive Museum collection. The tour will offer a behind-the-scenes opportunity to explore the history of luggage storage on early vehicles and the evolution of trunk space. Vehicles on the tour include the DeLorean and Manic with their small front storage areas, and several Rolls-Royces with elegant storage compartments. This tour is included with regular admission, members free. No rsvp necessary. This exhibit is presented by Myseum of Toronto and runs November 1 - 31, 2018 at the Canadian Automotive Museum with an opening reception on Friday, November 16 from 1-3pm. The opening reception is free and open to the public, with remarks at 1:30pm. Spirits of the Automobile is a family-friendly event that connects visitors with the personalities behind the automobiles. There will be new characters, new stories, and even a few news cars on display since last year. This interactive event allows visitors to discuss the automobiles with historic characters, gaining new insight into their lives and relationships with the cars. The Canadian Automotive Museum will open its doors for free during Doors Open Oshawa. Volunteers will be on hand to answer questions and complimentary family crafts will be available. The Canadian Automotive Museum will remain open by donation from 4 to 6pm on Friday August 19 as part of Kars on King. Stop in and see what's new at the museum. Bring your kids to the museum for an exciting day filled with arts and crafts, a scavenger hunt, family-friendly tours of the museum, and check out the star of Disney/Pixar's Cars 3 - Lightning McQueen! Our awesome friends from Balloons with a Twist will be back this year giving away balloon creations to all of our attendees. They'll be onsite from 11am to 2pm both days. No reservations required. Regular admission rates apply, members free. This program is recommended for ages 3-10. Join us for a special tour of the Canadian gallery in honour of Canada Day. Learn about Canada's automotive pioneers and success stories, as well as its struggles and scandals. This tour is included with regular admission, members free. Spectators have been enthralled by car racing since the first automobiles hit the roads. Author Tanya Bailey will take her audience back to the early days racing when pot holes were filled straw and safety went little beyond wearing goggles. Bailey has recently been working with the Canadian Automotive Museum as part of her Master's degree program. Her racing images and anecdotes are both entertaining and relevant for modern car enthusiasts. This talk is not to be missed, so mark you calendar! Heated seats, snow tires, and window defrosters oh my! What would we do in Canada without automotive innovations that keep us safe and dry during winter weather? Join our guides as they use the collection to explore the history of winter driving in Canada. This tour is included with admission. Members free. The world of automobiles has its share of spooky stories and colourful characters. This year the CAM's volunteers will bring to life some of our favourite stories from the collection using first person interpretation. You'll get a chance to chat with John DeLorean, Sam McLaughlin, Lady Eaton and more! This special event is included with regular admission and is great for all ages.